With all of the trams residing at the Heaton Park Tramway now safely undercover, no time has been wasted in preparing Blackpool Vanguard 619 for service for the first time since 2011. This tram had been covered with wooden boards and protective sheeting since November 2011 when it had been moved outside to accomodate Blackpool Brush Railcoach 623, but the availability of sufficient covered space in the new Lakeside Depot means that this is no longer necessary. On Tuesday 11th March, a small group of volunteers set to work on removing 619′s boards and sheets which have ensured that the interior was protected from the elements during its time spent in outside storage at the park. By the end of the day, the tram had been restored to its proper appearance, its rather sorry state of the last few years now nothing but a memory. Considering how long it has stood outside, 619 has survived almost completely unscathed: only some minor paintwork damage on the roof side panels and a cracked windscreen are evidence of its plight. Most of the red and cream paint, applied early in 2011, remains in good condition and mean that the tram should not need a repaint for the forseeable future. It is also mechanically sound, and indeed was taken for a test run on Sunday 9th March, proving that only minor work will be needed to get the car roadworthy again. 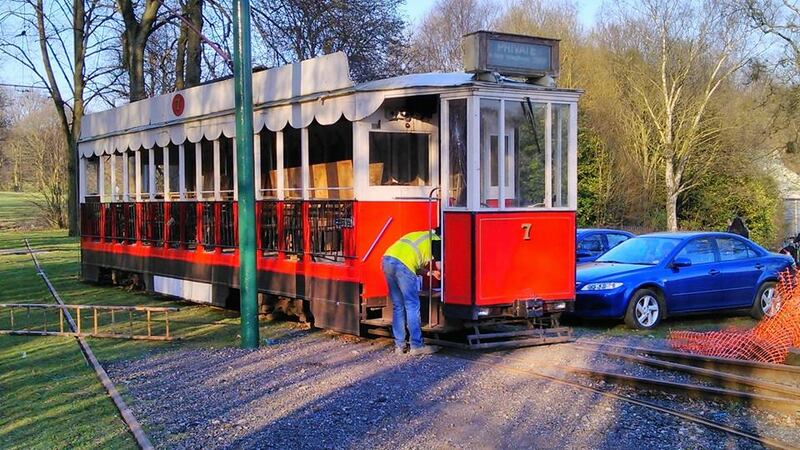 Work will now focus on preparing the car for service in time for 30th March, when the preserved tramway re-opens. This will also serve as the last ever day of passenger service for the tram in its current guise as Heaton Park 7, as shortly afterwards new vinyls will be applied restoring its authentic fleet number of 619. It is then expected to join Brush car 623 in regular use at the park from Easter onwards. This entry was posted in Heaton Park Tramway. Bookmark the permalink.